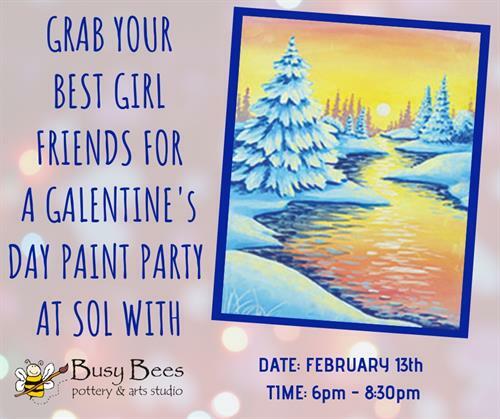 Join The Bees at SOL in Downtown Willoughby on February 13th from 6:00pm - 8:30pm for a Galentine's Day Party! The Busy Bees art instructors will be on hand to help you paint your this gorgeous "Winter Thaw" painting. Enjoy $3 tacos, a complimentary wine and house made "root" chips and salsa. This is a must attend night out with your girlfriends! *Price of workshop includes canvas and materials: brushes, paints, instruction, and one signature cocktail and chips & salsa.